PRC Hi-Fi and Video voted Samsung Dealer of the Year | What Hi-Fi? The awards ceremony took place at The Science Museum in London. PRC directors John and George Digwa received the award from Samsung UK's vice-president Andy Griffiths and Samsung UK general manager Colin Rodgers. Also present was Samsung UK managing director David Song. The PRC Samsung zone in Ilford, Essex is one of the UK's largest Samsung-branded outlets. The re-launch of the flagship outlet in July 2009 was just one example of PRC's success in a tough market, according to Samsung. 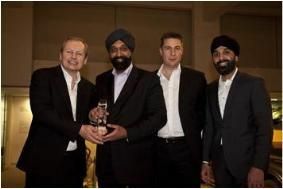 "The opening of the PRC Samsung zone in Ilford, which even included Bollywood superstar Shilpa Shetty, was a phenomenal success story in 2009, making PRC worthy winners of the Samsung Dealer of the Year Award," says Colin Rodgers.